How many fish should be in my pond? The rule of thumb for fish in ponds is 10 gallons of water per half inch of a fish. You very well may have too many fish and consider finding your fish friends a new home or adding more water to your feature (which may mean expansion is necessary). No more than once a day is recommended for your fish friends. As far as quantity is concerned, you want to give them enough to eat for no more than 2 to 3 minutes. If they are eating for longer than that, you should remove all excess food in the water. How many plants should I have? At the season’s peak, no more than 60% of your pond’s surface area should be covered or shaded by plants. Too many plants often causes oxygen deficiencies, especially at night, based on the photosynthetic process, as plants take in oxygen and exhale carbon dioxide. How do I know if my pump is the correct size for my pond? The water volume in your entire pond should be completely circulated at least once every hour. You want to ensure that your pump doesn’t have any debris restricting flow or that your pump isn’t trying to pump water higher than what it is capable. Every pump has limitations in its ability to flow, so looking at the side of your pump box can provide some more information specific to your water quantity. Of course, if these numbers or pump abilities feel out of your realm, you know how to reach us. What does it mean if there is a lot of decaying debris at the bottom of my pond? When you combine decaying debris, fish waste, and leftover fish food, ammonia levels spike high. 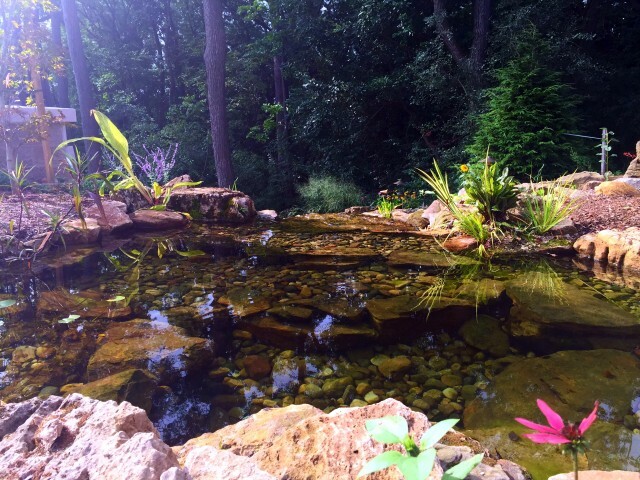 Sometimes the trick is to simply clean out your pond and add beneficial microbes and bacteria to help keep your water clean and balanced. What type of filtration should I have? Filters should coordinate with the size of your pond. Most manufacturers rate their filters based on ideal circumstances and size correlating to their product, and if your pond exceeds these, the filter will lose its efficiency. Always size-up filters so that it has the ability to clean more than the capacity of your pond. Most filters don’t need to be cleaned more than once a year. Again, referring to any manufacturing instructions will provide details to your specific type of filter. At what temperature should my pond water sit? When water temperatures exceed 75 degrees Fahrenheit, it is often difficult to retain acceptable levels of dissolved oxygen. This is where the importance of aquatic plants comes in, as they provide shade (which should cover 40% to 60% of the pond’s surface area). Adequate water circulation is also critical to maintaining appropriate temperatures and oxygen levels.